Tobacco companies knew that cigarette smoke contained radioactive alpha particles for more than four decades and developed "deep and intimate" knowledge of these particles' cancer-causing potential, but they deliberately kept their findings from the public, according to a new study by UCLA researchers. The analysis of dozens of previously unexamined internal tobacco industry documents, made available in 1998 as the result of a legal settlement, reveals that the industry was aware of cigarette radioactivity some five years earlier than previously thought and that tobacco companies, concerned about the potential lung cancer risk, began in-depth investigations into the possible effects of radioactivity on smokers as early as the 1960s. "The documents show that the industry was well aware of the presence of a radioactive substance in tobacco as early as 1959," the authors write. "Furthermore, the industry was not only cognizant of the potential 'cancerous growth' in the lungs of regular smokers, but also did quantitative radiobiological calculations to estimate the long-term lung radiation absorption dose of ionizing alpha particles emitted from cigarette smoke." The study, published online Sept. 27 in Nicotine & Tobacco Research, the peer-reviewed journal of the Society for Research on Nicotine and Tobacco, adds to a growing body of research detailing the industry's knowledge of cigarette smoke radioactivity and its efforts to suppress that information. "They knew that the cigarette smoke was radioactive way back then and that it could potentially result in cancer, and they deliberately kept that information under wraps," said the study's first author, Hrayr S. Karagueuzian, an adjunct professor of cardiology who conducts research at UCLA's Cardiovascular Research Laboratory, part of the David Geffen School of Medicine at UCLA. "Specifically, we show here that the industry used misleading statements to obfuscate the hazard of ionizing alpha particles to the lungs of smokers and, more importantly, banned any and all publication on tobacco smoke radioactivity." The radioactive substance — which the UCLA study shows was first brought to the attention of the tobacco industry in 1959 — was identified in 1964 as the isotope polonium-210, which emits carcinogenic alpha radiation. Polonium-210 can be found in all commercially available domestic and foreign cigarette brands, Karagueuzian said, and is absorbed by tobacco leaves through naturally occurring radon gas in the atmosphere and through high-phosphate chemical fertilizers used by tobacco growers. The substance is eventually inhaled by smokers into the lungs. The study outlines the industry's growing concerns about the cancer risk posed by polonium-210 inhalation and the research that industry scientists conducted over the decades to assess the radioactive isotope's potential effect on smokers — including one study that quantitatively measured the potential lung burden from radiation exposure in a two-pack-a-day smoker over a two-decade period. Karagueuzian and his colleagues made independent calculations using industry and academic data and arrived at results that very closely mirrored those of that industry study, which was conducted nearly a quarter-century ago. They then compared those results to rates used by the Environmental Protection Agency to estimate lung cancer risk among individuals exposed to similar amounts of alpha particle–emitting radon gas in their homes. "The gathered data from the documents on the relevant radiobiological parameters of the alpha particles — such as dose, distribution and retention time — permitted us to duplicate the industry's secretly estimated radiation absorbed dose by regular smokers over a 20- or 25-year period, which equaled 40 to 50 rads," he said. "These levels of rads, according to the EPA's estimate of lung cancer risk in residents exposed to radon gas, equal 120 to 138 deaths per 1,000 regular smokers over a 25-year period." Despite the potential risk of lung cancer, tobacco companies declined to adopt a technique discovered in 1959, and another discovered 1980, that could have helped eliminate polonium-210 from tobacco, the researchers said. The technique, known as an acid-wash, was found to be highly effective in removing the radioisotope from tobacco plants, where it forms a water-insoluble complex with the sticky, hair-like structures called trichomes that cover the leaves. And while the industry frequently cited concerns over the cost and the possible environmental impact as rationales for not using the acid wash, UCLA researchers uncovered documents that they say indicate the reason may have been far different. "The industry was concerned that the acid media would ionize the nicotine, making it more difficult to be absorbed into the brains of smokers and depriving them of that instant nicotine rush that fuels their addiction," Karagueuzian said. "The industry also were well aware that the curing of the tobacco leaves for more than a one-year period also would not eliminate the polonium-210, which has a half-life of 135 days, from the tobacco leaves because it was derived from its parent, lead-210, which has a half-life of 22 years." Karagueuzian said the insoluble alpha particles bind with resins in the cigarette smoke and get stuck and accumulate at the bronchial bifurcations of the lungs, forming "hot spots," instead of dispersing throughout the lungs. In fact, previous research on lung autopsies in smokers who died of lung cancer showed that malignant growths were primarily located at the same bronchial bifurcations where these hot spots reside. "We used to think that only the chemicals in the cigarettes were causing lung cancer," Karagueuzian said. "But the case of the these hot spots, acknowledged by the industry and academia alike, makes a strong case for an increased probability of long-term development of malignancies caused by the alpha particles. If we're lucky, the alpha particle–irradiated cell dies. If it doesn't, it could mutate and become cancerous." Karagueuzian said the findings are very timely in light of the June 2009 passage of the Family Smoking Prevention and Tobacco Control Act, which grants the U.S. Food and Drug Administration broad authority to regulate and remove harmful substances — with the exception of nicotine — from tobacco products. The UCLA research, he said, makes a strong case that the FDA ought to consider making the removal of alpha particles from tobacco products a top priority. "Such a move could have a considerable public health impact, due to the public's graphic perception of radiation hazards," he said. To uncover the information, Karagueuzian and his team combed through the internal tobacco industry documents made available online as part of the landmark 1998 Tobacco Master Settlement Agreement. Documents from Philip Morris, R.J. Reynolds, Lorillard, Brown I Williamson, the American Tobacco Company, the Tobacco Institutes and the Council for Tobacco Research, as well as the Bliley documents, were examined, Karagueuzian said. The team searched for key terms such as "polonium-210," "atmospheric fallout," "bronchial epithelium," "hot particle" and "lung cancer," among others. Karagueuzian said the earliest causal link between alpha particles and cancer was made around 1920, when alpha particle–emitting radium paint was used to paint luminescent numbers on watch dials. The painting was done by hand, and the workers commonly used their lips to produce a point on the tip of the paint brush. Many workers accumulated significant burdens of alpha particles through ingestion and absorption of radium-226 into the bones and subsequently developed jaw and mouth cancers. The practice was eventually discontinued. Another example involves liver cancer in patients exposed to chronic low-dose internal alpha particles emitted from the poorly soluble deposits of thorium dioxide after receiving the contrast agent Thorotrast. It has been suggested that the liver cancers resulted from point mutations of the tumor suppressor gene p53 by the accumulated alpha particles present in the contrast media. The use of Thorotrast as contrast agent was stopped in the 1950s. In addition to Karagueuzian, authors of the study include the late Amos Norman, professor emeritus in the departments of radiation oncology and radiological sciences at UCLA; James Sayre, of the departments of biostatistics and radiological sciences at UCLA; and Celia White, who served from 1999 to 2002 as director of content and services at the Legacy Tobacco Documents Library, which contains more than 13 million documents created by major tobacco companies related to their advertising, manufacturing, marketing, sales and scientific research activities. 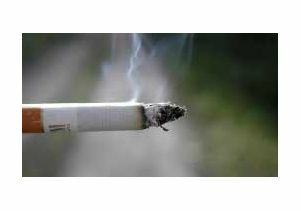 The study was funded by the University of California Tobacco-Related Disease Research Program, established by the passage of California's SB1613 in 1989 to fund a comprehensive University of California grant program to support research into the prevention, causes and treatment of tobacco-related diseases.